This is a specialty cake I made for a Christmas banquet last year. Its a red velvet cake with raspberry cream cheese filling. I crumb coated the cake with a thin layer of buttercream and then covered it in white fondant. For the border I made little balls of different shapes in colours matching the theme of the cake. 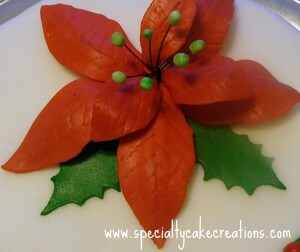 The poinsettia flower and holly leaves are made from fondant as well. Those who know a bit about sugar flowers will ask why this trouble? Truth is I didn’t know better at the time. 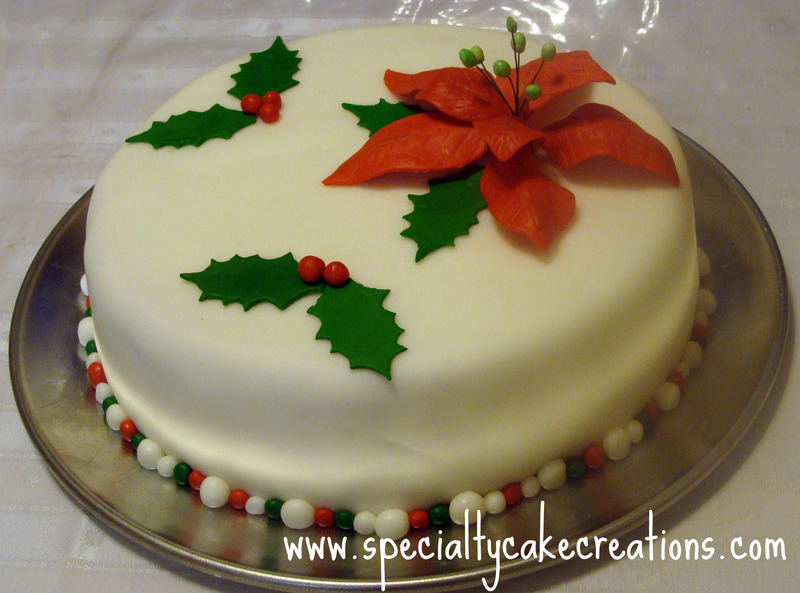 I just started out working with sugar doughs and had become comfortable with fondant already. But I tell you, unless you add some gum powder to your fondant you will make life hard for yourself. You won’t be able to roll out the dough too thinly, it will tear easily, and will take forever to dry, if it will at all. I myself use Gum-Tex from Wilton, which is a powder that you can just knead into your fondant. You can also use gum tragacanth or the cheaper tylose powder. They will make the dough more pliable and dry faster. Then there is gum paste. With the Gum-Tex I bought came a recipe for this and I love it since trying it out first. It’s my number one choice for making sugar flowers now. Gum paste can be rolled out almost paper-thin and you still have freedom to work with it. It makes more beautiful, delicate looking flowers. Next time I want share with you some of these flowers.